At Winter NAMM show 2014, Korg introduced the Kross keyboard. Kross is a mobile, affordable, keyboard workstation with audio/MIDI recording capabilities, AC or battery operation (6xAA), and a vast selection of cutting-edge sounds. Available with 61 keys or 88 fully-weighted keys, it's the first battery-powered, full-featured Korg keyboard workstation. 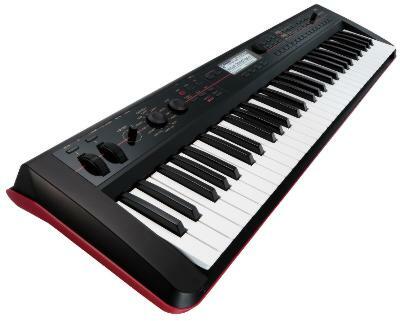 With rich sounds and practical features such as analogue-style step sequencing and built-in audio recorder, all in a lightweight and portable package, Kross offers keyboardists a versatile musical instrument at a very reasonable price point. A complete package of performance-ready sounds is provided. The piano, electric piano, and drum sounds have been taken from some of Korg's flagship instruments. The grand piano features intricately-sampled decays with three levels of velocity, and also reproduces the noises made by the damper pedal, ensuring that every nuance is reflected in the sound. The distinctive sounds from Korg's SG-1D Sampling Grand and M1 Music Workstation are also included, as well as an upright piano. The five classic electric piano sounds also include effect settings. In addition, careful attention has been paid to the drum sounds, which are indispensable for song writing and creation with the keyboard. Kross contains PCM data approximately twice as large as preceding Korg models such as the X50 and the PS60. Essential sounds like rock/jazz organ, strings, brass, and synth sounds have all been upgraded and enhanced. Also included are instruments such as toy piano, accordion, combo organ, church organ, and even vintage instruments such as a tape sampler. Unique to a keyboard of its class are sounds that excel in today’s EDM and electronica. The high-quality EDS-i sound engine is distilled from the EDS/EDS-X sound engines found on Korg's most advanced instruments. It allows a total of seven effects (five insert; two master) to be used simultaneously. Effect types include delay, reverb, chorus, flanger, and rotary speaker, as well as amp modeling powered by Korg's proprietary REMS modeling technology, and even a vocoder. In total, 134 high-quality effects are available. Kross includes a full-featured, 16-track MIDI sequencer with quantization, copy and paste, and individual note event editing, as well as an analogue-style step sequencer inherited from Korg's Electribe series, for quick production capability. The easy-to-use sequencer design features sixteen buttons that are used to turn individual notes on or off, allowing the user to quickly and easily create original rhythm patterns of up to 64 steps. SMF-format data can easily be exchanged with a computer via an optional SC card. A full set of workstation and production tools include a stereo audio recorder with overdubbing capabilities, a one-touch Drum Track function, and an arpeggiator to animate any type of sound. The Kross' top panel is a sleek black color, while the rear and side panels feature a bold red color scheme. The 61-key model, with its distinctive carrying handle, is amazingly light; at only 4.3 kg/9.5 lb, it's the most portable in its category. The 88-key model packs a piano-touch hammer action keyboard into a mere 12.4 kg/27.3 lbs. Both models can operate on an AC adapter or on six AA alkaline or nickel-metal hydride batteries.